That is the only conclusion I can reach based on this story on the Center for Biological Diversity challenging the EPA over ocean acidification. This is a typical man-is-screwing-up-the-climate EPA statement made to affect government opinion. It sounds official. If I were to publicly challenge it, they would likely label me as anti-science. The enlightening part of our story occurs when the Center for Biological Diversity took the EPA at their fear-mongering word and said, "well, then you should have an endangerment finding on the Pacific Ocean." The Lawsuit, launched by the Center for Biological Diversity, seeks to impose enhanced clean water act protection upon the Pacific Coast. The suit argues that protection is necessary because, according to the EPA’s own climate narrative, ocean acidification is severely damaging the marine ecosystem. 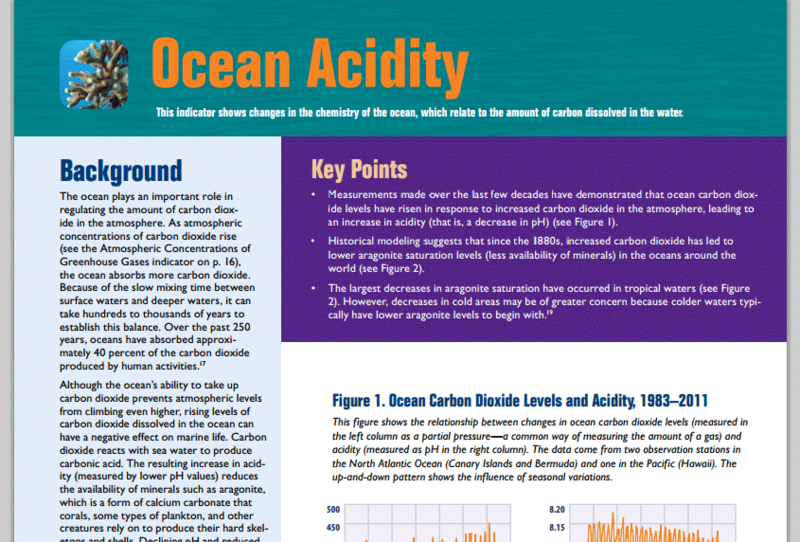 According to the IPCC, climate change (very high confidence) and ocean acidification (see Box 14.1) due to the direct effects of elevated CO2 concentrations (medium confidence) will impair a wide range of planktonic and other marine organisms that use aragonite to make their shells or skeletons (Fischlin et al., 2007). The EPA’s response is that there is insufficient evidence to support an endangerment finding – an apparent contradiction of their own previous climate narrative. The EPA's position is that there is no evidence, but it is a huge problem we should have every confidence exists. If you don't believe me, look at this passage from an EPA 2010 memorandum on the issue. Ignore the gobbledygook in the middle, just read it with the parts I have bolded. This Memorandum recognizes the seriousness of aquatic life impacts associated with OA [ocean acidification] and describes how States can move forward, where OA information exists, to address OA during the 303(d) 2012 listing cycle using the current 303(d) Integrated Reporting (IR) framework. At the same time, this Memorandum also acknowledges and recognizes that in the case of OA, information is largely absent or limited at this point in time to support the listing of waters for OA in many States. We are really really sure it is a problem although the science is largely absent. PS- By the way, no one thinks the ocean will turn to acid. "Acidification" is one of those scare words that work better as PR than science. The ocean is alkaline and will alkaline even under the most catastrophic forecasts. The issue is with its becoming less alkaline.